There's no shortage of leaks this week about the most anticipated handsets of the season - LG G5 and Galaxy S7 - that are about to be unveiled later this Sunday at the MWC expo in Barcelona. The latest in this installment series is a full frontal of the alleged Galaxy S7 Edge, and for the first time we see the phone operational as well, with the lock screen lit-up, and the stock wallpaper in the background. The phone doesn't look that much different from all the leaks so far, but now, with the screen on, it seems that the top bezel will be pretty narrow, hinting at a stellar screen-to-body ratio. If the 5.7" Note 5's ratio is any indication, Samsung could have achieved a great feat with the Galaxy S7 Edge as well, stuffing a 5.5" handset in a chassis more akin to a 5.3-incher in size. Fingers crossed. I dont like top and bottom its round just like iphone , and this big but we will see. Shame they don't do a standard version at this size, looks nice though. I want the larger display but I don't want the curve, damn you Samsung. For you, there is the note series. I am actually sad for people who want a curve and a small screen. I also want to try a new Samsung, but I find the normal S7 too small but I don't want an edge.. I think it's completely useless and it distracts too much. A note 6 with these rumored specs (or better) would be awesome, but I want to buy a new phone in H1. LOL why sad ? People like me have too small hands to comfortably hold a Note but still prefer larger screen. So, S7 Edge is perfect for me. I prefer to have all the screen I can get in as small as device as possible. Well, it's still not nearly as small as S6 or S7. That being said, if I was to buy a phone among these, I would go for the edge too. That 3600 mAh sounds too tempting. Apart from the squar-cle icons the phone looks good. Nothing a good icon pack and theme can't fix. Reviewers finally seem to start getting the demo units. So more leaks will come. PS. Samsung did awful job this year in keeping S7 a secret then its predecessors. True. 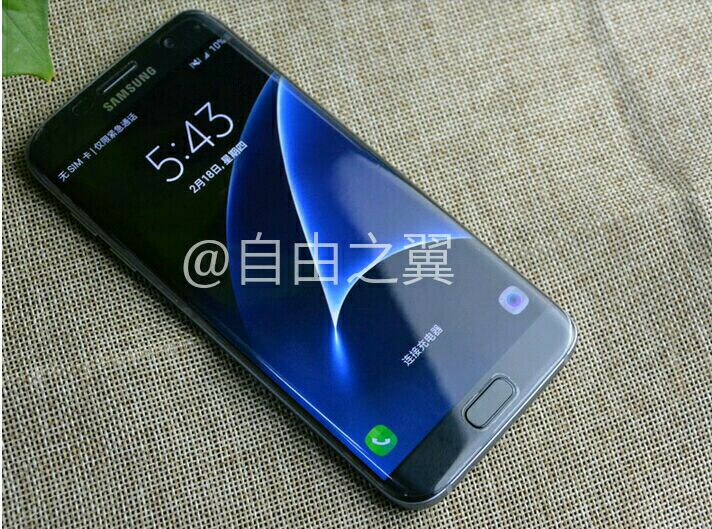 Last year the S6 didn't leak until like 1 day before the announcement, same with the S5. This looks nice. On other leaks it looks ugly. Better than S6 Edge. Nice. Just trying to compare this image to my S6 Edge in gold, the bottom bezel looks a tad smaller here & the side bezel (even tho its black) looks like it could be smaller too. I'm on a 2 year plan so this year wont make a difference to me but i always have to look & keep in the loop. Finaly a Galaxy all black. I'm definitely getting one. I really don't see much difference from the S6. And no USB-C is a disappointment. And I, personally, dislike a physical home button. That's 1 reason I won't upgrade to any iPhone or S-Series until it goes away. I'm still loving my Nexus 6P and its immediate firmware updates. And no branding. Oh, and no bloat ware.